The term structural flooring refers (usually) to wood floor boards, of minimum 20mm thickness (in the case of Oak and other strong hardwoods) that can be laid over joists (given appropriate spacing of joists). 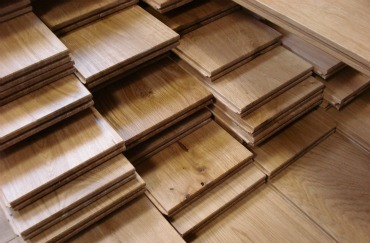 Structural wood floor boards can also be laid on to plywood over joists or on to plywood over concrete. Given an appropriate clean flat and dry concrete subfloor they can also be glued directly to the concrete using an appropriate liquid DPM & primer and adhesive. Expert advice should be sought in this regard. Softwood structural boards (usually Redwood or Whitewood) would normally be 22mm or thicker – expert guidance should be sought from your local building control officer as to what thickness of floor boards should be used over particular joist centres.